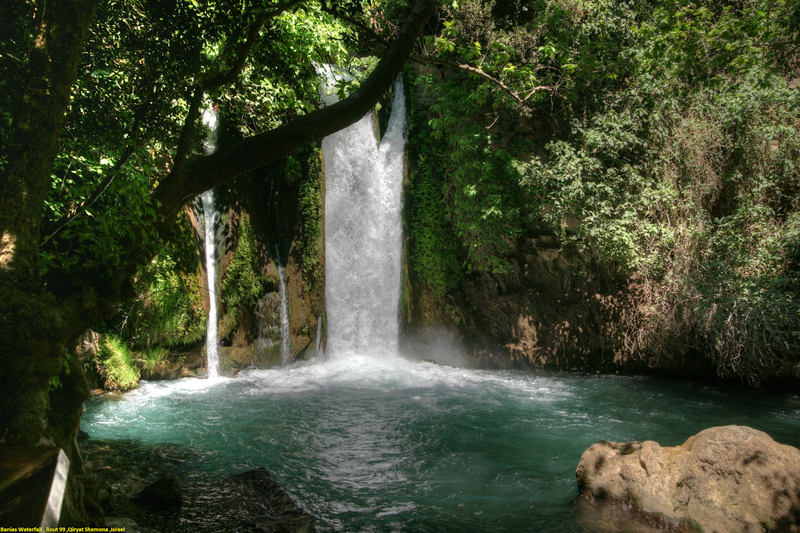 The Banias Waterfall provides one of Israel’s most beautifully tranquil spots. Set within the Banias Nature Reserve in the Golan, the Banias is a spring which rises from the base of Mount Hermon, Israel’s tallest mountain, flowing for about 3.5km through a gorge, eventually coming to the impressive waterfall, the largest in Israel.When the flow is at its fullest and most imposing, reaching a height of 33 feet. As the power of so many tons of water slams down, it creates a heavy mist that reaches visitors on the nearby observation deck, so expect to get a little wet.The name of the site is due to the temple of Panias (Banias in Arabic). There are two entrances to the Banias Nature Reserve and its four marked trails. The easiest path to the waterfall is a five or ten minute walk from the first entrance. While the waterfall can be reached within minutes of the parking area, if you have the time, consider following Trail #4 for a most memorable way to encounter the waterfall. It’s a 45-minute walk from the parking lot, through the scenic nature reserve, to view of the waterfall from the suspended bridge and walk back to the parking lot. The falls here are best visited during Israel’s rainy season, roughly November to April.